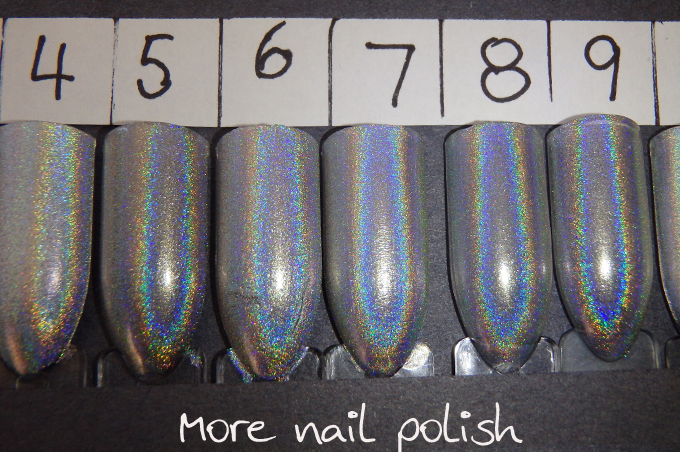 A few weeks back, someone in a Facebook group that I'm in did up a silver holo comparison on a nail wheel, and we all picked out which was our favourite before knowing which polish was which. I really enjoyed it as it included a whole bunch of silver holos I didn't own. Then it made me want to do it myself. I have 16 (!) 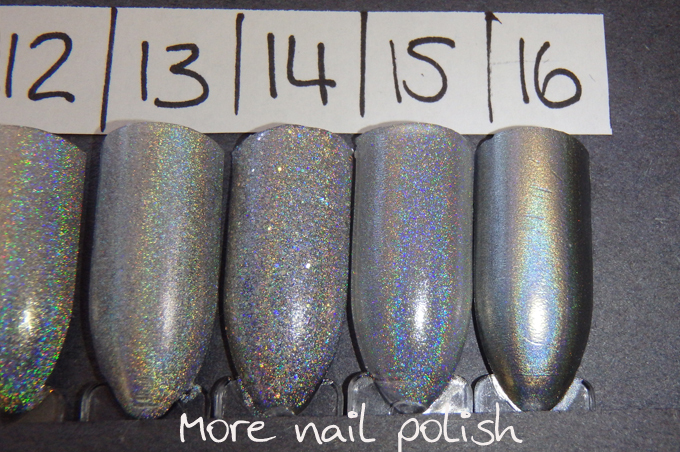 silver linear holos (and yes, there are still plenty that I don't have) and this comparison doesn't include any of the scattered holos. I've got a few photos and a video and I'd love you all to comment below which one is your favourite. After a few days I'll let you know which one was everyone's favourite as wells as which polish is which. The thing I loved about choosing a favourite holo from the ones shown in the Facebook group was that I didn't know which was which. I think you guys will find it hard to choose, because they are all so different and they offer different things. For the record, my favourite is number 3 for it's intense flame, with second favourites being #9 for it's sharp thin flame and #10 for it's smooth fine finish. I'm between 3 & 9. I'd say 9.. or 5. It's really hard to pick just one! I like 3, 5, and 9. 1 (or 2, they looks so similar!) 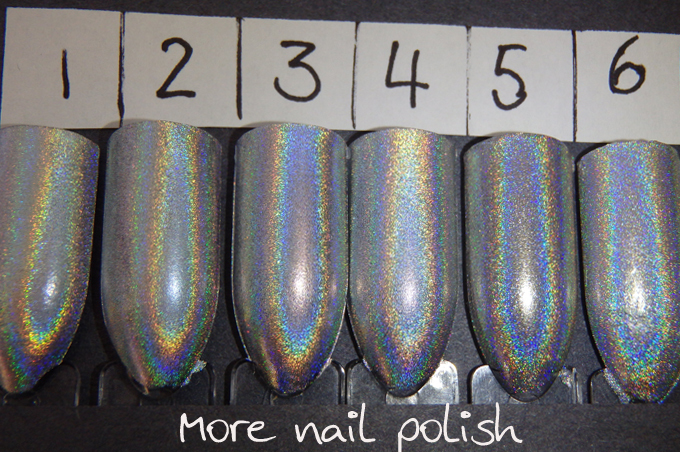 because its such a bright strong holo. 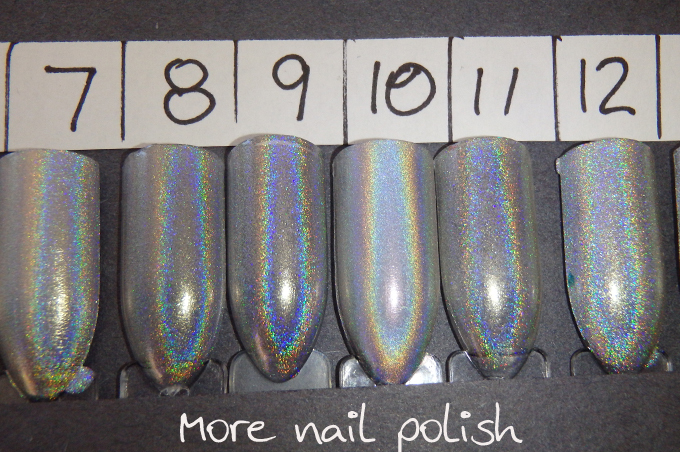 10 because of the strong smooth holo. And I actually really like 15. It almost looks scattered holo in the video. But I like how different and sparkly it is. For me it is dead heat between #3 and #9 and now I see that those two really must be the most striking. So many of us have noticed them. I think I can guess which one is #16 and in the video it seems a bit out of place as it looks a lot darker than the other ones. 5 and 9 are my favorites! 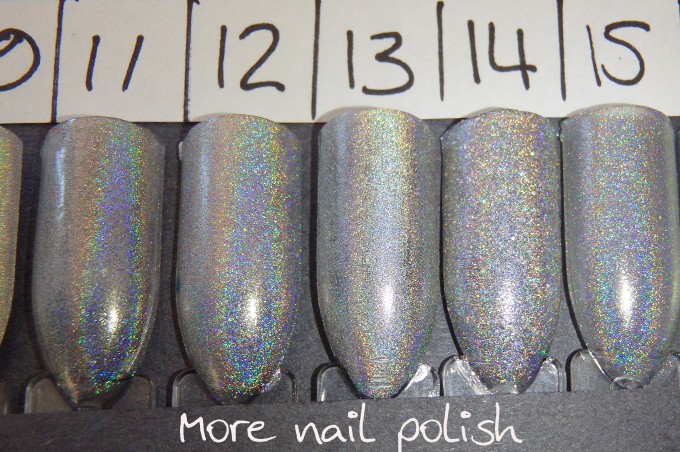 And #16 is China Glaze Cosmic Dust? 5 and 9 but its hard to pick! My favorites were 3, 10, and 16 in both the photos and the video. #3, #5 and #9 are my winners, love a good strong flame. #3, #5, #9 are my favourite. #10 is special. Definitely #3. Love its' intense flame and the tight color, especially inside the flame. I think I like 1 and 12 the best!